Our Towline includes a 43"mainline made with 3/8" 16 strand Polyethylene with an internal arctic bungee and a 48" tugline using 1/4" 16 strand Polyethylene with a 5/8" Italian Bronze Snap. It may be used for Skijoring, Bikejoring, Scooterjoring, Rollerbladejoring and even works awesome as a leash! A Solid Brass Quick Release Snap, 3-1/8" overall length is an available option for use when using the Skijor Belt and Extra Tuglines are available for running more than one dog. See these options when ordering the towline. Amy hooked us up with a 10' towline that is fantastic. Lime green is highly visible and fun, the polyethylene material is new to us - super easy to clean! I love that the towline is two integrated components, makes for a nice handle between the tug and mainlines when needed. 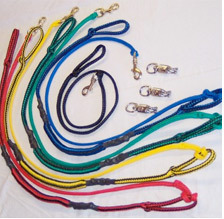 The bungee is fantastic, it will definitely stand up to our Carolina Dog's pulling!